Friday April 13th 2012, usually a day noted for superstition, was a day well waited for by the Greek community and Public Relations Student Society of America. At 6:00PM until 10PM the Kholer field house was blackened with the exception of neon yellow and green strobe lights. Greek men and women formed a sea of hot pink shirts with a light blue “B+” on the front with white PRSSA shirts stating “Reputation is everything” as they gathered together to start ESU’s first dance marathon. The dance marathon benefited The B+ Andrew McDonough Foundation. Planning for this event started a full year ago when the idea was presented at both a Panhellenic Conference and Interfaternity Council meeting. The idea stemmed from Pennsylvania University’s “THON” which is a student-run dance marathon held for two days. Sam Pearce, a junior and brother of Theta Chi fraternity, states: “The structure was fairly easy to follow; it just took some time to form a committee”. Fundraising teams were formed by individual sorority and fraternity chapter. The participating Greek letter organizations were: Alpha Omicron Pi, Alpha Sigma Tau, Delta Chi, Kappa Delta Rho, Phi Sigma Kappa, Sigma Pi, Sigma Sigma Sigma and Theta Chi. The top five Greek teams stand as Theta Chi fraternity with $6,565 dollars, Alpha Sigma Tau with $1,530 dollars, Sigma Sigma Sigma with $1,525 dollars, Alpha Omicron Pi with $1,229, and Sigma Pi Fraternity with $910.00. The highest rose from a non-Greek organization is PRSSA with $335.00. DJ Hitz and DJ Legit had no problem pleasing the crowd as everyone began to dance. Both Greek members and students in PRSSA inter mingled in high spirits to celebrate their efforts thus far in raising funds for their first B+ Hero. This year, the B+ Andrew McDonough Foundation assigned participating organizations at ESU a local East Stroudsburg eight year old girl named Naomi as the sole beneficiary to any proceeds raised through this event. Around 6:30PM, after a song or two had turned Kholer field-house into contagiously spirited dance floor, the music began to die down and came to a complete stop. Upon the stage there stood the Burg Boogie host, Sam Pearce, accompanied by a little girl. As the men and women came to a stop and focused their attention to center stage, Pearce announced that our hero had arrived. Inspired by having a network of friends who knew Andrew McDonough, Pearce gave the crowd words of encouragement to keep dancing on behalf of our young hero. The night went on as Naomi met her supporters in and out of Greek Life. She made her rounds to each chapter, some with banners and baskets for her and took a picture with the members. Naomi, with her mother, brother, and three sisters took the time to get to know the organization’s members as well. Aimee Alfonso, a sister of Sigma Sigma Sigma commented: “Naomi’s mother didn’t know that this was all for her, she could not be more excited”. When asked to dance, Naomi replied with a shy response “I don’t know how” where sisters and brothers offered excitedly to show her. Other activities Naomi participated in included basketball and a game of toss with different students. 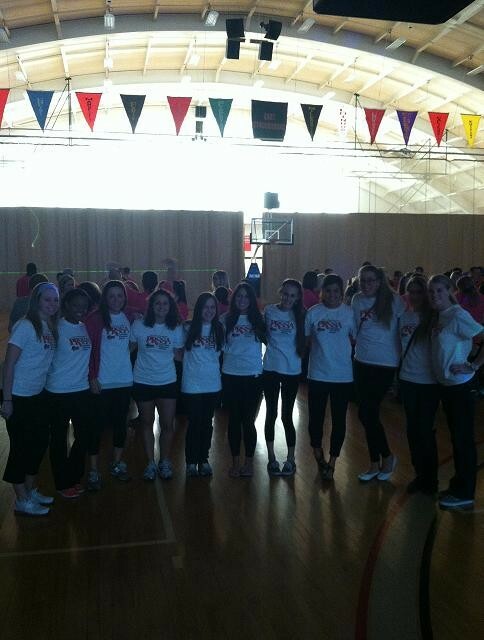 The Burg for Boogie Dance Marathon served the community of East Stroudsburg through the B+ Hero, Naomi. In the greater purpose it served as a way to bring together not only different Greek chapters, but student organizations under a common purpose. As said by the leader of this event, Sam Pearce, “Greeks are raised to a higher standard. We do community service within our own chapters, but it is rare that it is noticed. Burg for Boogie was my attempt to unite our community and serve others, as that is the intention of a Greek organization”. In a quote from PRSSA’s Vice President of Programming, SeanAnn Kelly, she stated: “I feel as a student that the health of children is so important. All of the people involved in the Burg Boogie were in great health willing to help those in need. Maybe by inspiring children from this foundation, we could encourage them to go to college themselves”.